Growing up I had the privilege of enjoying the fresh homemade breakfast and a lunch packed by my Mom. She used to wake up around 5.00 am and get both the breakfast and lunch ready for us before we head to school. I am not sure how she managed to get everything done within the short time. Being a picky eater, I would just nibble some breakfast for the name sake and drink a glass of milk and run for my bus. The breakfast was really enjoyed as an evening snack by me. Since my Mom knew me better, she would make a fresh batch and get it ready when I am back from school. My brother and I used to enjoy the warm 'Puttu and Kadala' (steamed rice cake with chickpeas curry) she used to give us in 'Urullas' (a small handmade ball of food) even when we were in college. Yes, we were spoiled to the core :). But those were some good nostalgia I cherish. Kids of this generation are so independent and miss all those tiny things we enjoyed while we were kids. Even though I am not a morning person, I wake up pretty early to go to work. But I am not too passionate about making an elaborate Indian style breakfast on the weekday mornings. Like I had mentioned in several posts, a quick and easy breakfast works out for everyone in my house hold. So I am in the constant hunt for a healthy breakfast that makes my kids happy and keep them full till lunch. 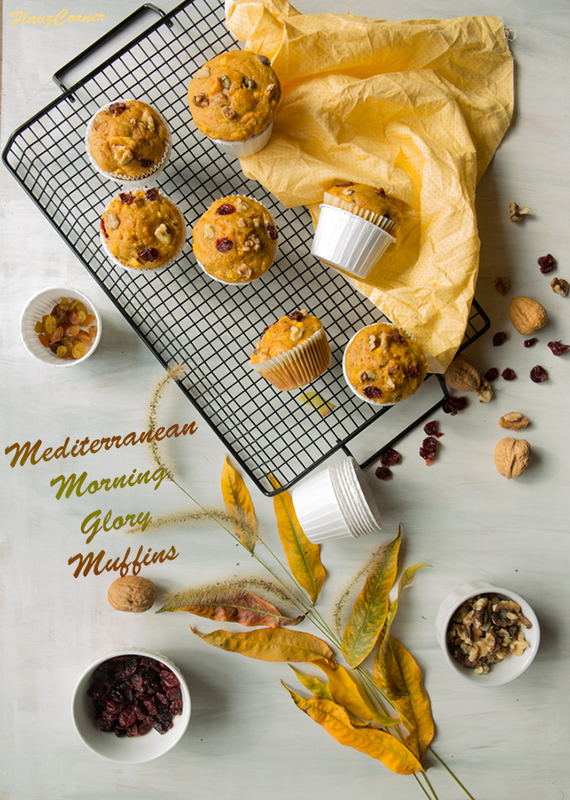 This recipe is an inspiration from the famous Mediterranean muffins. 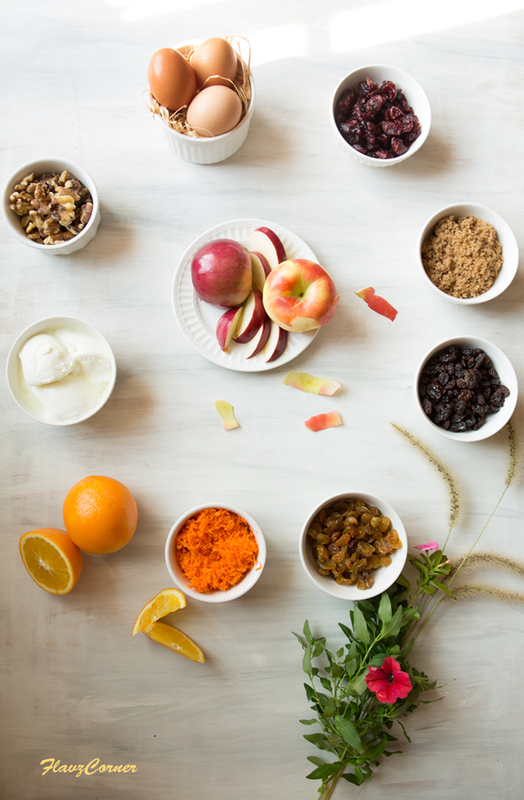 It’s fruity, nutty, healthy and yet delicious. I strongly recommend you to give this recipe a try. These muffins are one of my family favorites now. Pre-heat oven to 375 ° F.
Beat the eggs and brown sugar together in a mixing bowl using a stand mixer or hand mixer. Add, oil, yogurt, orange juice, grated carrots and chopped apples and mix well. Now add the sifted flour mix and mix till well combined. Add the nuts and raisin cranberry mix to the batter and mix well. Line the muffin tins with cupcake liners. Use an ice cream scoop to fill the muffin tin up to three fourth. Sprinkle the topping mix on the top of the batter and gently press it with the back of a dry spoon. Bake the muffins from 18-20 minutes or till the center of muffin is cooked well. 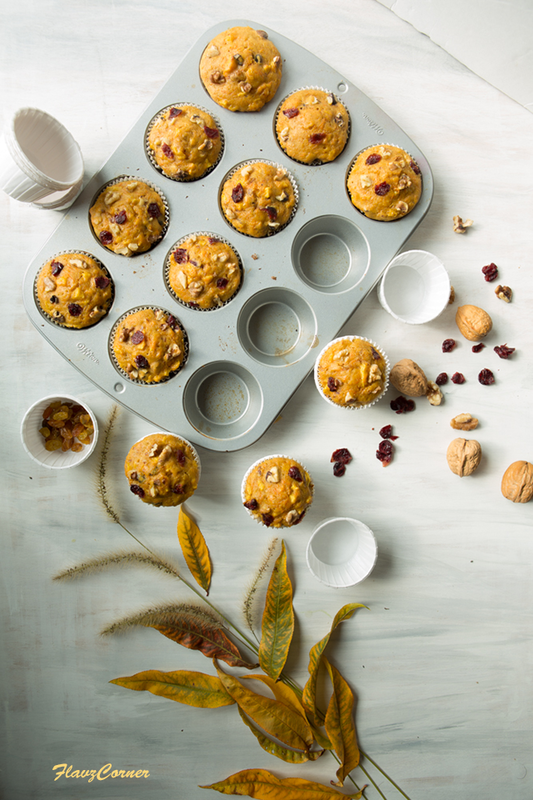 Cool the muffins on wire rack and enjoy. The left overs can be stored at room temperature for a day if you your house is not too warm and humid. Otherwise you can store them in air tight container in the refrigerator. Microwave for 20 seconds to warm up the refrigerated muffin. 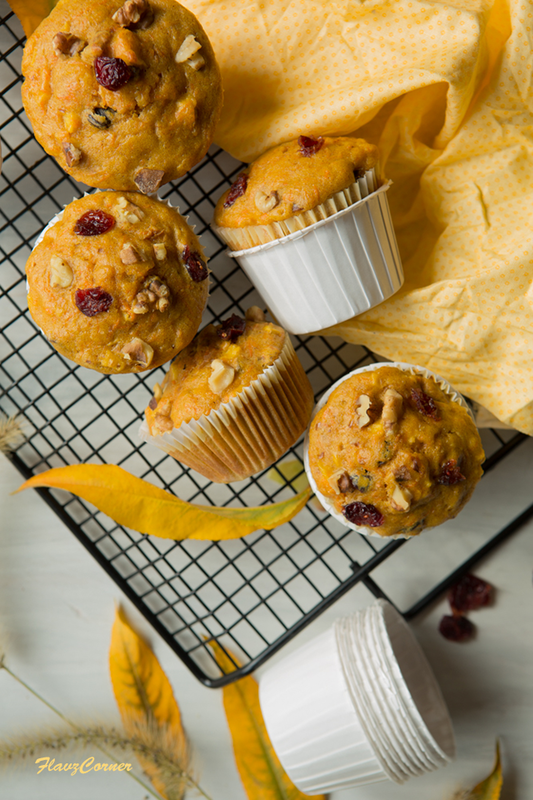 Love these Fall themed muffins..so wonderfully golden brown and delicious. I'm not a morning person either! Although I think these muffins could convert me to one. :-) Really nice -- thanks.